In her 2017 book Big Chicken, Maryn McKenna tells the story of antibiotic abuse in agriculture. In the 1940s the US military used antibiotics to treat soldiers suffering from infectious disease, one of the first large-scale uses of these drugs. Penicillin had been placed in the public domain, and the world was in an optimistic mood at having a widely available treatment for common infections. Soon after the war, in 1948, British-American scientist Thomas Jukes, working at Lederle Laboratories in New Jersey, showed that chickens gained more weight when their food included antibiotics, even on a poor diet. This was a crucial discovery for industrializing chicken rearing. Until then, poultry in the USA were mostly reared in small batches, allowed to range freely in fields, where they scratched a natural diet of plants and bugs, sometimes supplemented with fish meal. Chickens are by nature highly omnivorous. Discovering that antibiotics helped to fatten chickens meant that the birds could be fed cheap, low-grade maize and soybean. The FDA (Food and Drug Administration) approved antibiotics as a growth regulator in the USA in 1951. By the 1950s, a successful chicken farmer in Georgia, Jesse Dixon Jewell, began to expand his operation by selling chicks and feed to other farmers, and buying their finished birds. The feed was laced with antibiotics, partly to boost growth but also to control bacterial diseases. Industry would soon follow this twin example of farming out the birds to contract growers, and including the antibiotics in their prepared rations. By 2001, Americans were taking 3 million pounds (1.4 million kilos) of antibiotics, while US livestock was being dosed with 24.6 million pounds (11.2 million kilos). For many years there were few if any concerns about this unprecedented use of a human drug to boost food production, and cheap meat was certainly popular. But this relaxed attitude began to change when research showed that much of the antibiotics ended up in the meat and eggs that consumers ate. This widespread use meant that once valuable drugs began to be compromised as bacteria that caused disease in humans became resistant to the antibiotics. Under pressure from pharmaceutical companies, the US government was slow to restrict antibiotics as animal growth promotors. Finally, the large poultry companies began to self-regulate. By about 2009 they realized that they could produce birds without antibiotics, simply by using vaccines and improving farm hygiene. By 2014 some of the largest producers in the US, like Foster Farms and Perdue Farms, had stopped feeding antibiotics to chickens. Various grocery stores and fast food chains soon banned chicken raised on antibiotics. In September 2016 the UN moved to curb non-prophylactic antibiotic use in animals, which was linked to an estimated 700,000 human deaths worldwide, per year. In North America and Western Europe antibiotic abuse was by then largely solved, thanks to improved industry standards, government regulations and public awareness. But McKenna cautions that livestock antibiotic abuse remains a worrying problem in much of South America, South Asia and China. As soon as I finished reading Big Chicken, Ana and I visited La Cancha, the vast, open air market that still functions in Cochabamba, where we bought a little grey hen and a big red one. Feeding the hens was a chance to learn what smallholder farmers have always known: that chickens are as omnivorous as people. Chickens prefer meat to vegetables. Ours preferred the smaller, denser grains like sorghum to corn. Chickens especially like sow bugs, the little roly-poly crustaceans that live in leaf litter worldwide. Our hens learned to knock the seeds off of amaranth plants and then eat the seeds from the ground. Chickens also like table scraps, including meat, but especially eggs. The longer we keep these birds, now named Oxford and Cambridge, the bigger their eggs get. They both lay an egg every day; clearly the hunter-gatherer diet agrees with them. The problem, as McKenna explains, is that factory farming made chicken as cheap as bread in the USA and Europe. People living in low income countries now want their chance at cheap meat. Chicken is cheap in Bolivia and easily affordable. In the open air market it sells for just 10 Bs. ($1.40) per kilo and fried chicken restaurants have sprung up all over the city. Rearing chickens has become a new industry in Bolivia. Farmers can make a barn with cheap lumber and plastic sheeting, buy the day-old chicks and purchase the feed by the bag or the ton. No doubt many of the poultry producers in Bolivia are careful and conscientious. But many growers raise their birds on feed blended with antibiotics, labelled as a growth promotor, and there is little public awareness of the risk of antibiotics in animal feed. While there are compelling reasons to reduce the cost of food in low income countries, the global South also needs to consider the risks of animal antibiotics. Maryn 2017 Big Chicken: The Incredible Story of how Antibiotics Created Modern Agriculture and Changed the Way the World Eats. Washington DC: National Geographic. 400 pp. En su libro Big Chicken de 2017, Maryn McKenna cuenta la historia del abuso de antibióticos en la agricultura. En la década de 1940, el ejército de los Estados Unidos usó los antibióticos para tratar a los soldados que se padecían de enfermedades infecciosas, uno de los primeros usos a gran escala de estas drogas. La penicilina se había colocado en el dominio público, y el mundo estaba optimista de tener un tratamiento ampliamente disponible para infecciones comunes. Poco después de la guerra, en 1948, el científico británico-americano Thomas Jukes, que trabajaba en Lederle Laboratories en Nueva Jersey, demostró que los pollos ganaban más peso cuando sus alimentos incluían antibióticos, incluso con una dieta pobre. Este fue un descubrimiento crucial para la industrialización de la crianza de pollos. Hasta entonces, las aves de corral en los Estados Unidos se criaban principalmente en pequeños lotes; se les permitía ir libremente a los campos, donde arañaban una dieta natural de plantas e insectos, a veces complementada con harina de pescado. Los pollos son por naturaleza altamente omnívoros. Descubrir que los antibióticos ayudaban a engordar pollos significaba que las aves podrían ser alimentadas con maíz y soya baratos. La FDA (Administración de Alimentos y Medicamentos) aprobó los antibióticos como un regulador de crecimiento en los Estados Unidos en 1951. En la década de 1950, un exitoso granjero de pollos en Georgia, Jesse Dixon Jewell, comenzó a expandir su operación vendiendo pollos y alimento concentrado a otros granjeros, y comprando sus aves terminadas. El concentrado se mezclaba con antibióticos, en parte para estimular el crecimiento, pero también para controlar las enfermedades bacterianas. La industria pronto seguiría este doble ejemplo de criar las aves por contrato e incluir los antibióticos en sus raciones preparadas. En 2001, los estadounidenses tomaron 1,4 millones de kilos de antibióticos, mientras que el ganado estadounidense se dosificó con 11,2 millones de kilos. Durante muchos años hubo poca o ninguna preocupación sobre este uso sin precedentes de una droga humana para impulsar la producción de alimentos, y sin duda la carne barata fue popular. Pero esta actitud relajada comenzó a cambiar cuando la investigación mostró que gran parte de los antibióticos quedaban en la carne y los huevos que consumían los consumidores. Este uso generalizado significó que las bacterias que causan enfermedades humanas se volvieron resistentes a los antibióticos por su uso excesivo en los animales. Bajo la presión de las compañías farmacéuticas, el gobierno estadounidense hizo poco para restringir los antibióticos como promotores del crecimiento animal. Finalmente, las grandes compañías avícolas comenzaron a autorregularse. Alrededor de 2009 se dieron cuenta de que podían producir aves sin antibióticos, simplemente usando vacunas y mejorando la higiene de la granja. Para 2014, algunos de los productores más grandes de Norteamérica, como Foster Farms y Perdue Farms, habían dejado de alimentar con antibióticos a los pollos. Varios supermercados y cadenas de comida rápida pronto prohibieron el pollo criado con antibióticos. En septiembre de 2016, la ONU actuó para frenar el uso de antibióticos no profilácticos en animales, lo que se relacionó con unas estimadas 700,000 muertes humanas en todo el mundo, por año. En América del Norte y Europa occidental, el abuso de antibióticos se resolvió en gran medida, gracias a la mejora de los estándares de la industria, las regulaciones gubernamentales y la conciencia pública. Pero McKenna advierte que el abuso de antibióticos en los animales sigue siendo un problema preocupante en gran parte de Sudamérica, el sur de Asia y China. 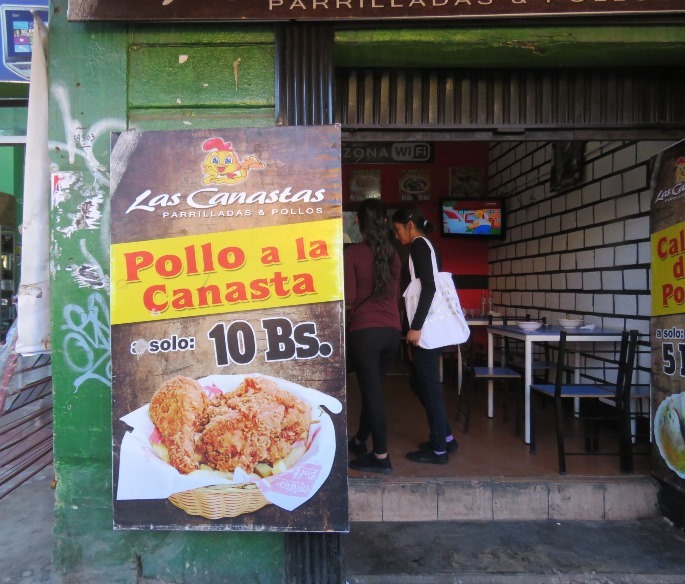 Tan pronto como terminé de leer Big Chicken, Ana y yo visitamos La Cancha, el vasto mercado al aire libre que todavía funciona en Cochabamba, donde compramos una gallinita gris y una roja grande. Alimentar a las gallinas fue una oportunidad de aprender lo que los pequeños agricultores siempre han sabido: que los pollos son tan omnívoros como las personas. Los pollos prefieren la carne a las verduras. Prefieren los granos más pequeños y densos como el sorgo al maíz. A las gallinas les encantan los llamados chanchitos, los pequeños crustáceos redondos que viven en la hojarasca en todo el mundo. 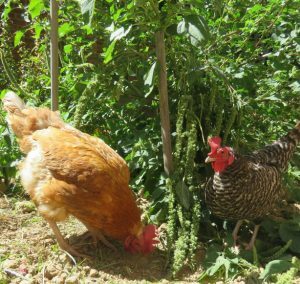 Nuestras gallinas aprendieron a sacudir las semillas de las plantas de amaranto y luego a comer las semillas del suelo. A los pollos también les gustan los restos de comida, incluida la carne, pero especialmente los huevos. Mientras más tiempo tengamos estas aves, ahora llamadas Oxford y Cambridge, más grandes son sus huevos. Cada una pone un huevo todos los días; claramente la dieta de los cazadores-recolectores les hace bien. El problema, como explica McKenna, es que las granjas industriales hacían que el pollo fuera tan barato como el pan en los Estados Unidos y Europa. La gente en los países de bajos ingresos ahora quiere la carne barata; les toca. El pollo es barato en Bolivia y es fácilmente asequible. En la Cancha se vende por solo 10 Bs. ($ 1.40) por kilo y restaurantes de pollo frito han surgido por toda la ciudad. La cría de pollos se ha convertido en una nueva industria en Bolivia. Los agricultores pueden hacer un granero con madera barata y hojas de plástico, comprar los pollitos de un día y comprar el alimento por bolsa o por tonelada. Sin duda, muchos de los productores avícolas en Bolivia son cuidadosos y concienzudos. Sin embargo, muchos crían a sus aves con alimentos mezclados con antibióticos, vendidos como promotores del crecimiento, y hay poca conciencia pública sobre el riesgo de los antibióticos en la alimentación animal. Si bien existen razones convincentes para reducir el costo de los alimentos en los países de bajos ingresos, el Sur Global también debe considerar los riesgos de los antibióticos en los animales.